What Makes South Africa a Top Tourist Destination? Soweto is an urban settlement or 'township' in South Africa, southwest of Johannesburg, with a population of approximately 1.3 million, dwelling in homes ranging from extravagant mansions to makeshift shacks. Soweto was created in the 1930s when the White government started separating Blacks from Whites. Blacks were moved away from Johannesburg, to an area separated from White suburbs. They did this by using the infamous 'Urban Areas Act' in 1923. Soweto obtained its name from the first two letters of South Western Township which was the original description of the area. The first residents of what is now known as Soweto were located into the area called Klipspruit following their relocation from “Coolietown” in the centre of Johannesburg as a result of an outbreak of bubonic plague. Only black families were located into Klipspruit and the housing was on a rental basis. Klipspruit was subsequently renamed Pimville. In 1959 the residents of Sophiatown were forcibly removed to Soweto and occupied the area known as Meadowlands. Located in the Gauteng province, today Soweto is the biggest black urban settlement in Africa with a rich political history. It was the centre of political campaigns aimed at the overthrow of the apartheid state. The township experienced civil unrest during the Apartheid regime. The 1976 student uprising, also known as the Soweto uprising, started in Soweto and spread to the rest of the country, but riots flared up again in 1985 and continued until the first multiracial elections were held in April 1994. Soweto is a melting pot of South African cultures and has developed its own sub-cultures especially for the young people. Sowetans (as Soweto residents are called) have evolved a local language called tsotsitaal, an eclectic mix of several local languages, Afrikaans and street slang, constantly evolving and spoken mainly by the young. It is again in Soweto where you find South Africa’s most famous street - Vilakazi Street. Two Nobel Prize winners lived in this street, Nelson Mandela and Archbishop Emeritus Desmond Tutu. In fact, Tutu, as he is more fondly known, still lives in this street with his wife Leah. Mandela's house has become a museum. It is called the Mandela House Museum and is open for public tours during the week. 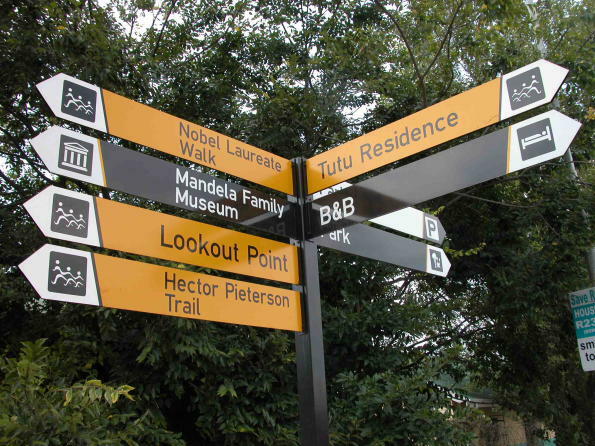 In the corner of Moema and Vilakazi Streets you will find the Hector Peterson Museum and memorial. This is where Hector Peterson was killed by police during the students' uprising of June 16 1976, today celebrated as Youth Day. You can also have a glimpse of the mansion belonging to the late Winnie Madikizela-Mandela in an affluent part of Orlando West. In 2010, the South Africa's oldest township hosted the Soccer FIFA World Cup first match in the African soil, when the host nation played Mexico into a 1 all draw. To get a full and perfect view of Soweto, you need to stand on the foot bridge of the Chris Hani Baragwanath Hospital or the Soweto Towers. There is no reason to let tight budgets stop you and your family from making some pretty special memories. While some would argue that travel is a luxury, we here at Travel2Africa could not disagree more. It's a necessity and just a quick scan of your best memories and experiences should remind you of its value. Whether you like to bundle up or prefer to head for warmer weather, here are 5 top winter holiday spots the whole family will enjoy. 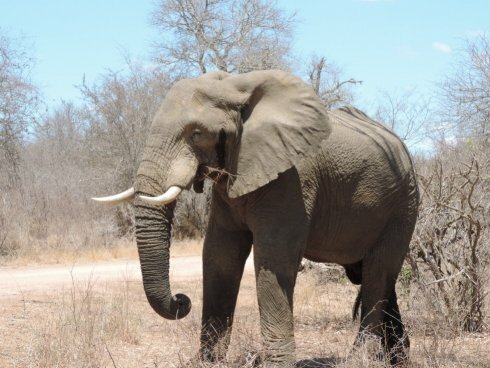 Located in Mpumalanga and Limpopo, The Kruger National Park is one of the biggest game reserve in Africa. With all the available accommodation in the park, Satara Rest Camp is especially great for children, with a playground, kids educational programme and grassy areas. Further north lies Shingwedzi Rest Camp, which offers more rustic accommodation and is great for game viewing in winter. Adults will love the wildlife, game drives, guided bush walks, 4x4 adventure trails and restaurants, while their kids enjoy playgrounds, kid’s educational programmes and wild animals. Lowveld is the warmer part of Mpumalanga province, covering towns like Nelspruit, White River and Kaapsehoop. Classy accommodation like Forever resorts, Blyde Canyon and Swadini offer loads of family entertainment, including heated kids pools. Your kids will love the motor museum, horse-riding, Mac Mac Adventure Zone and Mankele Mountain Bike Park. Adults will love the 4x4 routes, adventure sports (rafting, tubing, quad biking, abseiling, zipline, paintball, rock climbing, rock climbing, white river rating), hot air balloon trips, microlight trips, aerial cable trail, day trips to Sabie, Graskop, Pilgrim’s Rest, Blyde River Canyon and several waterfalls. The Golden Gate National Park is located in the Free State. With a variety of family cottages, rondawels at different hotels and rest camps, including at the Basotho cultural village, the Golden Gate has just enough accommodation for you and your entire family. Main attractions for adults include walking trails, lookout points, game drives, scenery, restaurant, coffee shop and a pub. Kids can also enjoy themselves in the snow, Basotho cultural village, vulture restaurant and curio shop. 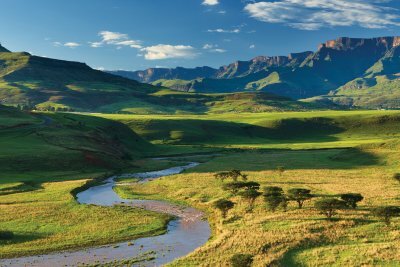 Southern Drakensburg is a beautiful place located in KwaZulu-Natal, ±209km from the famous Durban city. Bushman’s Nek Berg, Trout Resort and Sani Mountain Lodge all have family accommodation and entertainment for children. You and your kids will be mesmerized by the wellness spas, 4x4 routes, golf course, trout fishing bird watching, snow on Sani Pass (4x4 only), New England farm, adventure golf, tractor rides and horse-riding. Located in the coastal side of the kingdom of KwaZulu-Natal, running from Durban to Port Edward. Family-friendly resorts such as Cabana Beach (Umhlanga Rocks), La Cote D’Azur (Margate) and Pumula Beach Hotel (Umzumbe) offer self-catering accommodation, restaurants, shops and daily entertainment programmes for kids will leave you and your family speechless. Your kids will love, Durban Beachfront Funworld amusement park, uShaka Marine World theme park and aquarium, ice-skating, surfing, rickshaw rides, flea markets, beach holiday programmes, Segway tours of Moses Mabhida Stadium, Umgeni Bird Park and Natal Sharks Board. Adults will enjoy the blue flag beaches, sunbathing, mountain biking, quad-biking, shopping, golfing, day-trips to the North Coast (including Ballito), Oribi Gorge Swing and spas.